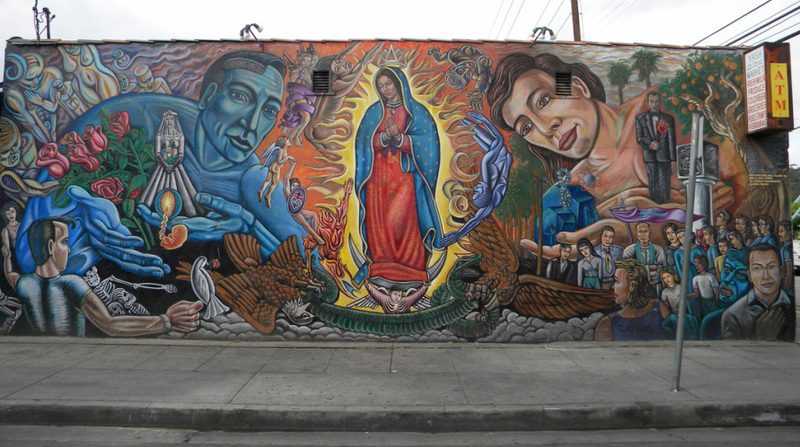 The Mural of a praying Virgin of Guadalupe is a very common idol in the Latino neighborhoods of Los Angeles, where the mural tradition of Mexico is very prevalent in society. This is considered a master symbol by scholars in all of society and people around the world. Although, according to Wolf, the belief in the symbol as a master symbol and having ideology for all Mexicans cannot be true. “In 1531, The Virgin Mary appeared to Juan Diego in 1531 according to legend; Mexico’s patron saint, The Virgin of Guadalupe appeared and showed off her beauty and character on Tepeyac Hill north of Mexico City which is the site of the former temple of Tonantzin, the earth goddess of the Aztecs and the virgin mother of many of the Aztecs' gods that were worshiped by the native Indians and also by the people of their own society. To emphasize the encounter of the virgin was true, she stated to Juan that a church be built on the hill” (Wolf, 2007). After her presence was gone, Juan Diego noticed a print of roses on Juan Diego's cloak. When this occurred, word spread fast throughout the community. This sighting is what started and brought up the conversation to bring in millions of Indians and people of society to Catholicism and has then become a grand symbol of Mexican culture of daily prayer and belief to people around the world. Sharing a geographical space in relation to the people of society who are all connected in some way or another all have a great impact on what you do. The feeling of being independent and free; determining the way you choose to go in life is all what drives the humans and people all around the world in society to choose their own beliefs and ways of life. In the art world of expressing your beliefs, being professional about certain situations is what drives the community to stand alone when it comes to certain issues. According to Judith, “The art community is really about disconnection, in the sense that we really foster individuation. We foster competitiveness. We foster within our art schools and universities the sense of instantly disconnecting people from where they came to engage in the creation of what is called a universal aesthetic, and that universal aesthetic is essentially a western European aesthetic and it’s very specific. It’s geographically specific, ethnically specific. It is intellectually specific. And yet we call that universal and what happens is that people become very isolated and choose to stand on their ideologies and commitment to themselves” (Judith F. Baca, 1996). This way of life determined by having your own thoughts and ideologies is noted as the common place to be grounded when it comes to making your intellectual decisions for the greater good. Knowledge is power, having great relationships is key in relation to your ideologies and culture, making your own decisions is very critical, and lastly being competitive for that notion of expression is what will take you higher and higher than most people in your own society will go. Stand up for what you believe in and never hold back. “All of the murals portrayed of our Lady of Guadalupe in Los Angeles and around the world have become very honorable pieces and also have become a cultural connection to Mexico in the past, to the present day times” (Rodriguez, 1994). The Virgin Mary is displayed constantly, whether it be on a picture, notebook, and as a symbol of God everywhere in the world. Our Lady of Guadalupe is also a sign of good luck and safe journeys on adventure and travel and therefore displays the title of Immaculate Perception.